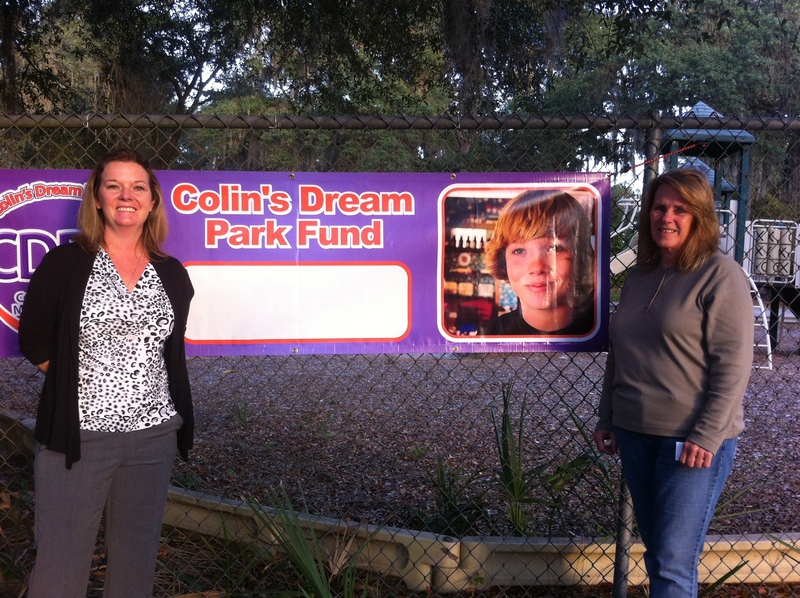 Colin’s Dream Park – On it’s way! 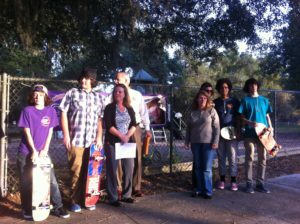 The effort to build a skate park for the children of Orange City is one step closer to becoming a reality. We have pledged one of our CDs full value to help the park become a reality. 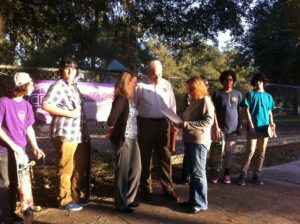 Here are pics of Mayor Laputka making the announcement at Coleman Park where the tBall court will become the skate park! 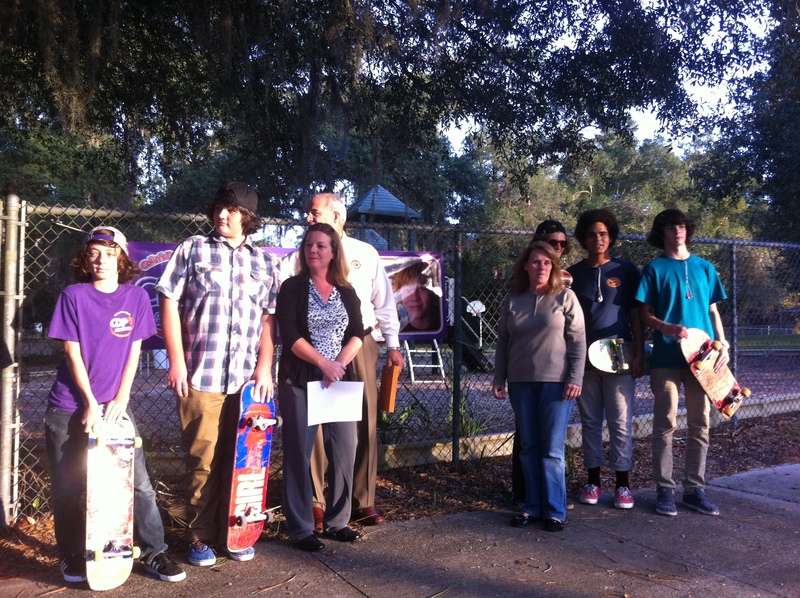 Present is our President Priscilla Ballasy and Casi Sprague Colin’s Mom and some of Colin’s skateboarding friends. Who has touched my life sometime. Of feeling quite the same. Than it was before you came. Is knowing folks like you. Please join us tomorrow at Jane Murray Hall located next to the First Congregational Church at 201 W. University Ave at noon! Get involved in your community!! Free lunch and find out what we are all about!!! Our next District 6 meeting will be the Arts/Crafts festival. 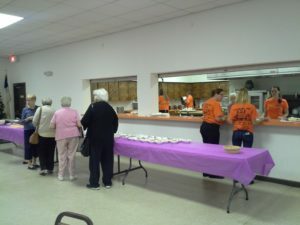 GFWC Melbourne Woman’s Club is hostess. It will be Thursday, February 20, 2014 at the Melbourne Elks Lodge #1744, 211 South Nieman Ave. Melbourne Florida. More details will be sent in the Call after the first of the year but wanted you to get this meeting scheduled on your calendars. Next item: please remember to nominate someone from your club to attend the LEADS seminar to be held at our GFWC Headquarters in Lakeland on January 18th. The DEADLINE TO SUBMIT NOMINATIONS IS DECEMBER 1st. You can get the information and the form on-line at gfwcflorida.org One candidate will be selected to represent each of our 14 districts. Please choose a nominee that you feel has the desire to become a leader in our Federation! Next: Hopefully everyone has received their club membership dues forms. If not, please let me know right away. Hope everyone has a wonderful Thanksgiving holiday. Gosh, there is not much left of this year. Where did it go? Saturday – Nov 23rd 10 – 11 AM. Heart House Grand Opening. 114 W. Walts Ave. Deland. Tours and refreshments. 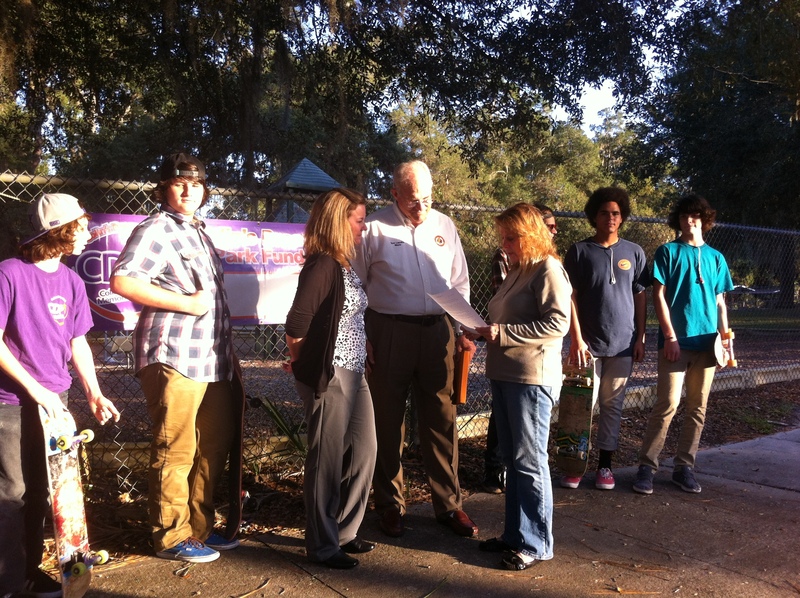 West Volusia County’s only emergency shelter for families. 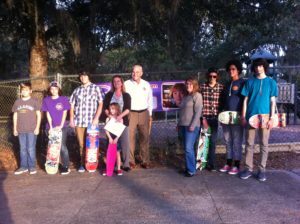 This is part of the Neighborhood Center of West Volusia that we donate to. This event is free and open to the public. Monday – December 2nd. 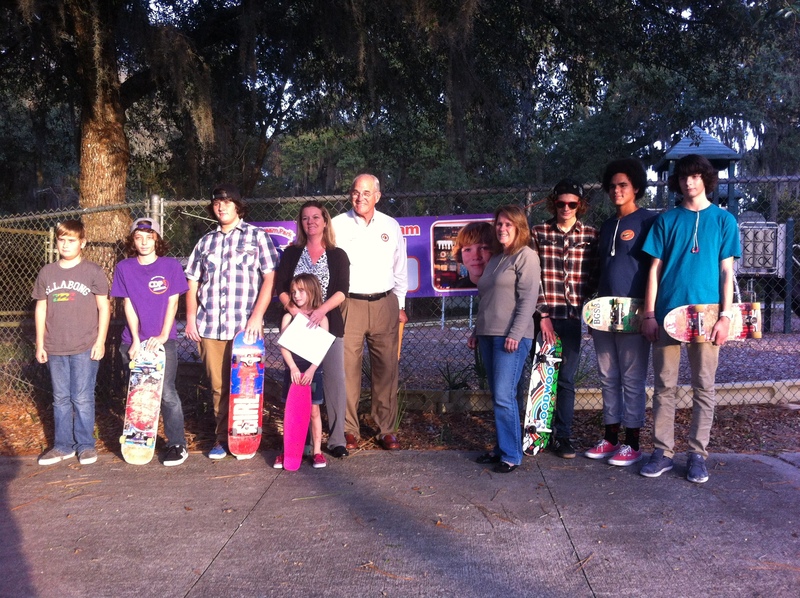 The Mayor, Tom Laputka, has indicated that he would like to have the presentation made to Casi for the Skate Board Park on this day. However, he has not yet specified a time. He would like to have this happen in Coleman Park with all present and have pics taken. Will advise as soon as I have more info. Stay tuned. Tuesday, December 10th. Received a card from the ladies of the Deland GFWC inviting us to join them for their “Green Tea” that will be held this day at the club house at 128 West Michigan Ave. Event will be at 1:30PM. Kay Laws needs to know if you will be attending no later then Dec 3rd either by email (klaws1@cfl.rr.com) or by phone 386-736-7676. Please contact her and let her know if you are interested in attending this event. And just a reminder, Thursday, December 5 is our next meeting. I already have 2 guests coming. 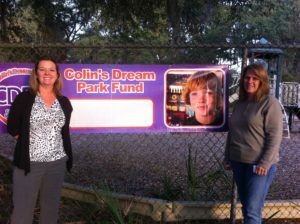 Thanks to all of the ladies (and their guys) who attended the Colin’s Dream Park Dinner! The dinner was a big success. It was good food, good friends and good times. Letter from the President about our Meeting this week! Good Morning ladies. This coming Thursday, Nov 7th we will have our next meeting. Board meeting at 9 AM at the Albertus Cottage and the regular meeting will be at 1 PM but remember that social time will start at 12:30. That is the time where we will have our goodies and be able to catch up with everyone. if you are making calls for the meeting please respond to Louise Clarke as to the count as she is the chair person for this event. Special Note: If you went to the fashion show and bought something, please wear it to the meeting for all to see. Over 40 authors have signed up to share their talents with the general public. Books of all genres will be available for sale. It’s not too early to begin Christmas shopping, so what could be nicer than a gift personally signed by the author? Presentations from a variety of authors, including Mimi, will cover a wide range of topics. A special workshop, “Social Media Made Simple,” by Donna Loader, President/CEO of Royal Support Services, Inc., takes place at 8:45 a.m. Although this workshop is designed for authors participating in the book fair, others may be interested in this topic as well and may attend. There is plenty of free parking, and the event is free to the public. The Book Fair, together with Gram’s Scrub Jay Café, located on the library premises, and the adjacent Lyonia Preserve offer a pleasurable day for all the family.